This guideline has been adapted from the supplementary data of the article by Faure and Callebaut, Bioinformatics (2013) in press. Hydrophobic Cluster Analysis (HCA) is based on a two-dimensional representation of the protein sequence, in which hydrophobic amino acids congregate into clusters (Callebaut, et al., 1997; Gaboriaud, et al., 1987; Figure 1). Statistical studies performed on experimental 3D structures have shown that hydrophobic clusters mainly correspond to regular secondary structures, and have supported the relevance of the chosen hydrophobic alphabet, as well as the alpha-helix as 2D support for revealing this structural information (Woodcock, et al., 1992). Figure 1: Principle of the HCA plot, illustrated on a sequence segment of the alpha1-antitrypsin (adapted from (Callebaut, et al., 1997)). The protein sequence (1D), in which hydrophobic amino acids are represented as white letters, is written on a alpha-helix, displayed on a cylinder. This one is cut along the horizontal axis and unrolled, in order to get the full environment of each amino acid, as it exists on the 1D sequence. Hydrophobic amino acids (V, I, L, F, M, Y, W) are encircled and their contours are joined. These form clusters, which were shown to mainly correspond to regular secondary structures (alpha helices and beta strands), as examplified here with the 3D representation of the two clusters (only the hydrophobic side chains are represented). The shape of the clusters is often typical of the associated secondary structures. Hence, horizontal and vertical clusters are mainly associated with alpha helices and beta strands, respectively. A dictionary of hydrophobic clusters, gathering the main structural features of the most frequent hydrophobic clusters has been published (Eudes, et al., 2007), helping the interpretation of HCA plots (http://bioserv.impmc.upmc.fr/hca-seq.html). Sequence segments separating hydrophobic clusters (at least 4 non hydrophobic amino acids or a proline) mainly correspond to loops (or hinge regions between globular domains). Symbols are used to represent amino acids with peculiar structural properties (star for proline, black diamond for glycine, square and dotted square for threonine and serine, respectively, which may be either exposed or buried). Several 2D supports have been tested, revealing that the alpha-helix provides the best correspondence between the positions of hydrophobic clusters and regular secondary structures (Woodcock, et al., 1992), as well as the maximal 2D compactness (Callebaut, et al., 1997). The two-dimensional support dictates the segmentation rules of a sequence into clusters, exactly as spacers separate words in a text. Hence, two hydrophobic amino acids participate in two distinct clusters, if they are separated by at least 4 four non-hydrophobic amino acids or a proline, in the case of an alpha-helical support. This minimal number of non-hydrophobic amino acids is called the connectivity distance and is linked to the distance separating an amino acid from its furthest close neighbor. The 2D support is thus a convenient mean for revealing the 2D neighborhood of each amino acid. Hydrophobic clusters, which are binary patterns constrained by the connectivity distance, are much more informative than simple binary patterns as they allow to reveal the 2D context in which the binary pattern is embedded (Hennetin, et al., 2003). Approximately 200 different species of hydrophobic clusters (a species corresponding to a given constrained binary pattern), which bring together a large part of the total number of hydrophobic clusters, have strong tendencies towards alpha helices or beta strands (Eudes, et al., 2007). HCA is often considered as an approach allowing the prediction of secondary structures from the only knowledge of a protein sequence. It however allows to combine this prediction with the comparison of 1D sequences, which makes it a powerful tool for helping the identification of remote relationships. Identification of repeated sequences is an immediate output of the analysis of HCA plots (see 1 for references, Figure 2), but HCA can also be used for identifying relevant 2D signals in the non significant results provided by current similarity search methods. In both cases, amino acid identities and similarities can be put at the level of the HCA plots and evaluated in the context of the secondary structure content. The shapes of hydrophobic clusters, containing the hydrophobic amino acids for which hydrophobicity is conserved in the 1D alignment, can be compared and put into perspective to the minimal hydrophobic core positions, which can be defined from a set of homologous sequences (Poupon and Mornon, 1998). The ability of HCA to identify remote relationships relies on the evolutive robustness of hydrophobic clusters, as compared to 1D sequences, but also on the independence of the method relative to indels, which can be large and limit the alignment of related sequences to only a small part of the domain (Figure 3). Figure 2: Example of the detection of an internal duplication in the mouse chromobox homolog 1 (CBX1_MOUSE, UniProt P83917). Globular domains (boxed), containing approximately one third of hydrophobic amino acids gathered into clusters, are separated by a hinge, which is clearly less hydrophobic. The comparison of the HCA plots of the two domains indicates similar shapes of clusters (shaded green and red), suggesting a structural relationship. This potential relationship is further strengthened by sequence identities (shaded yellow) identified relative to the conserved positions of hydrophobic amino acids within clusters and is supported here at the 3D level (the observed 2D and 3D structures of the chromo and chromo-shadow domains of this protein are shown up to the HCA plot (pdb identifiers: 1AP0 and 1DZ1, respectively)). The hydrophobic clusters shaded in green and red correspond to the internal strand beta 2 and to the C-terminal alpha helix, respectively. In the chromo shadow domain, the loop linking strand beta3 and the C-terminal alpha helix includes a short alpha helix, containing two alanine residues. Figure 3: Example of a HCA alignment with large indels. Comparison of the HCA plots of BEACH domains A2 with ConA-like lectin domains, whose 3D structures are known (extracted from (Burgess, et al., 2009)). Conserved hydrophobic residues are shaded, the vertical lines indicating the correspondences between the different sequences. HCA detected conserved motifs in the N-terminal region (corresponding to strands t2 and b3 (motif a), and before), which are not detected by automatic tools, due to the large insertions separating them from the lectin core in human LYST. Note that the ConA-like lectin domain does not overlap the whole length of domain A2, as defined here. The C-terminal region of domain A2 may thus include the missing strands b1 f1 t1. 1. The first published example relies on the identification of a repeated domain in the extracellular region of cytokine receptors (Thoreau et al., 1991) and several other examples have illustrated since this ability for detecting repeated domains (e.g. BRCT domains in BRCA1 (Callebaut & Mornon, 1997a), BAH domains in DNA methyltransferases (Callebaut et al., 1999), Chromo and Chromo-shadow domains in HP1 (Ye et al., 1997), LEM domains in inner nuclear membrane proteins (Laguri et al., 2001, Lin et al., 2000) and ZP-N domains in Zona Pellucida proteins (Callebaut et al. 2007) or repeated motifs (e.g. blades of beta propellers in RAG2 (Callebaut & Mornon, 1998) and in Sec12 (Callebaut & Chardin, 2002), OCRE imperfect repeats (Callebaut & Mornon, 2005)). 2. e.g. FKBP domain in trigger factor (Callebaut & Mornon, 1995), GTFs in P.falciparum (Callebaut et al. (2005), relationship of Cernunnos to Nej1/XRCC4 (Callebaut et al., 2006), a concanavalin A-like lectin domain in CHS1/LYST (Burgess et al. , 2009). 3. e.g. BRCT (Callebaut & Mornon, 1997a), TUDOR (Callebaut & Mornon, 1997b), BAH (Callebaut et al., 1999), RUN (Callebaut et al., 2001), LOTUS (Callebaut & Mornon, 2010). 4. e.g. Glycoside hydrolases (Henrissat et al., 1995), hydrolases of the beta-CASP family of metallo-enzymes (Callebaut et al., 2002). • Burgess, A., et al. 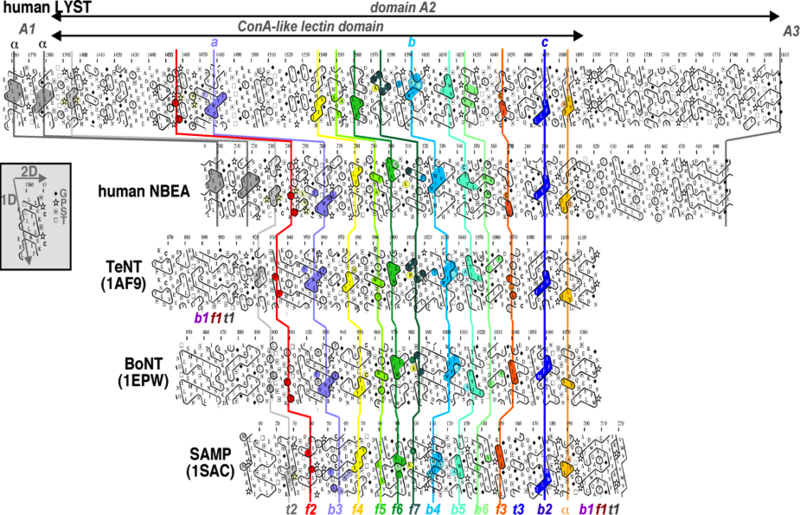 (2009) A concanavalin A-like lectin domain in the CHS1/LYST protein, shared by members of the BEACH family., Bioinformatics, 25, 1219-1222. • Callebaut, I. and Mornon, J.P. (1995) Trigger factor, one of the Escherichia coli chaperone proteins, is an original member of the FKBP family., FEBS Lett. , 374, 211-215. • Callebaut, I., et al. (1997) Deciphering protein sequence information through hydrophobic cluster analysis (HCA): current status and perspectives, Cell. Mol. Life Sci., 53, 621-645. • Callebaut, I. and Mornon, J.P. (1997a) From BRCA1 to RAP1: a widespread BRCT module closely associated with DNA repair., FEBS Lett, 400, 25-30. • Callebaut, I. and Mornon, J.P. (1997b) The human EBNA-2 coactivator p100: multidomain organization and relationship to the staphylococcal nuclease fold and to the tudor protein involved in Drosophila melanogaster development, Biochem J, 321, 125-132. • Callebaut, I. and Mornon, J.P. (1998) The V(D)J recombination activating protein RAG2 consists of a six-bladed propeller and a PHD fingerlike domain, as revealed by sequence analysis., Cell Mol Life Sci, 54, 880-891. • Callebaut, I., Courvalin, J.C. and Mornon, J.P. (1999) The BAH (bromo-adjacent homology) domain: a link between DNA methylation, replication and transcriptional regulation., FEBS Lett, 446, 189-193. • Callebaut, I., et al. (2001) RUN domains: a new family of domains involved in Ras-like GTPase signaling., Trends Biochem Sci, 26, 79-83. • Callebaut, I., et al. (2002) Metallo-beta-lactamase fold within nucleic acids processing enzymes: the beta-CASP family., Nucleic Acids Res, 30, 3592-3601. • Callebaut, I. and Chardin, P. (2002) The yeast Sar exchange factor Sec12, and its higher organism orthologs, fold as beta-propellers., FEBS Lett, 525, 171-173. • Callebaut, I., et al. (2005) Prediction of the general transcription factors associated with RNA polymerase II in Plasmodium falciparum: conserved features and differences relative to other eukaryotes., BMC Genomics, 6, 100. • Callebaut, I. and Mornon, J.P. (2005) OCRE: a novel domain made of imperfect, aromatic-rich octamer repeats., Bioinformatics, 21, 699-702. • Callebaut, I., et al. (2006) Cernunnos interacts with the XRCC4 x DNA-ligase IV complex and is homologous to the yeast nonhomologous end-joining factor Nej1., J Biol Chem, 281, 13857-13860. • Callebaut, I., Mornon, J.P. and Monget, P. (2007) Isolated ZP-N domains constitute the N-terminal extensions of Zona Pellucida proteins., Bioinformatics, 23, 1871-1874. • Callebaut, I. and Mornon, J.P. (2010) LOTUS, a new domain associated with small RNA pathways in the germline., Bioinformatics, 26, 1140-1144. • Eudes, R., et al. (2007) A generalized analysis of hydrophobic and loop clusters within globular protein sequences, BMC structural biology, 7, 2. • Faure, G. and Callebaut, I. (2013) Identification of hidden relationships from the coupling of Hydrophobic Cluster Analysis and Domain Architecture information, Bioinformatics, in press. • Gaboriaud, C., et al. (1987) Hydrophobic cluster analysis: an efficient new way to compare and analyse amino acid sequences., FEBS Lett, 224, 149-155. • Hennetin, J., et al. (2003) Non-intertwined binary patterns of hydrophobic/nonhydrophobic amino acids are considerably better markers of regular secondary structures than nonconstrained patterns., Proteins, 51, 236-244. • Henrissat, B., et al. (1995) Conserved catalytic machinery and the prediction of a common fold for several families of glycosyl hydrolases., Proc Natl Acad Sci U S A, 92, 7090-7094. • Laguri, C., et al. 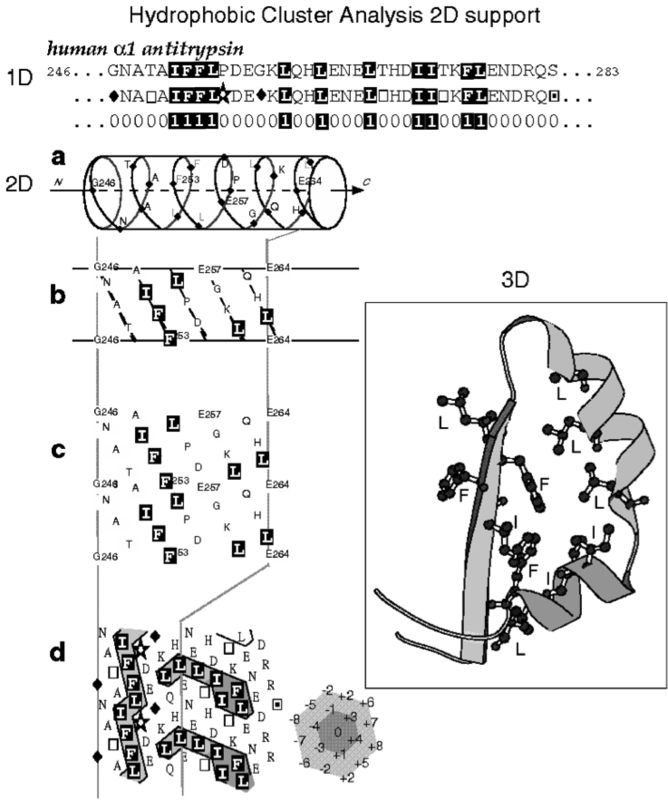 (2001) Structural characterization of the LEM motif common to three human inner nuclear membrane proteins., Structure, 9, 503-511. • Lin, F., et al. (2000) MAN1, an inner nuclear membrane protein that shares the LEM domain with lamina-associated polypeptide 2 and emerin., J Biol Chem, 275, 4840-4847. • Poupon, A. and Mornon, J.P. (1998) Populations of hydrophobic amino acids within protein globular domains: identification of conserved "topohydrophobic" positions., Proteins, 33, 329-342. • Thoreau, E., et al. (1991) Structural symmetry of the extracellular domain of the cytokine/growth hormone/prolactin receptor family and interferon receptors revealed by hydrophobic cluster analysis., FEBS Lett. , 282, 26-31. • Woodcock, S., Mornon, J.P. and Henrissat, B. (1992) Detection of secondary structure elements in proteins by hydrophobic cluster analysis., Protein Eng, 5, 629-635. • Ye, Q., et al. (1997) Domain-specific interactions of human HP1-type chromodomain proteins and inner nuclear membrane protein LBR., J Biol Chem., 272, 14983-14989.